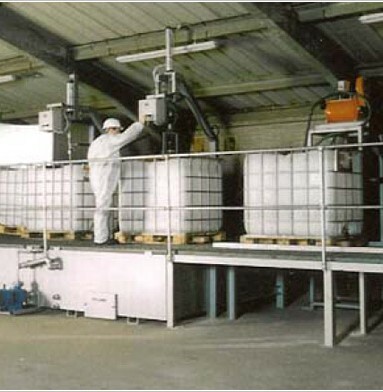 The Challenger Drumtech IBC Reprocessing Line is designed to wash, rinse and dry used IBC containers for re – use as a usable package generally as shown in the photograph above and the containers are transferred between stations by hand. Where licensed disposal operators contain them for removal. Alternatively, they can be treated on site by the users own separating / treatment plant. The sump is independent from the other tanks and has mud doors to allow flushing out and sludge removal. Stage 2: Located above this sump, is used as an outside jetting area where labels are removed and soiling is washed off using a high pressure washing lance. A splashguard is incorporated at the rear of the platform. Uses a re-circulated hot caustic detergent wash inside the container to chemically clean the inside. The Head is positioned using pneumatics into the IBC which seal against overspill and on being given a signal operates the timed wash cycle. The wash tank uses a steam coil for heating the detergent. The tank is complete with pump, filters and mud doors for cleaning. By the virtue of using a chemical pre-wash stage, the load on the power jetting system is reduced by means of removing the bulk of the residues coating the IBC walls and base. Consists of a high pressure jetting station for the inside of the container. This drains into a sump below which overflows back to the pre – wash stage 3. So that finally removed deposits naturally balance back toward the containment tank. A motorised cyclic high-pressure head is introduced into the IBC by means of pneumatics, which also seal against splashing. The cyclic operation ensures full coverage of the interior of the container under high-pressure jets. The power unit has the facility to give a hot rinse using fuel oil as a heating medium if desired though normally it is used cold. Detergent can be introduced if desired although this stage is usually a rinse stage. A timer is used to give a controlled process. This station is used to remove residues from the pockets either side of the valve area, and any residual water. Vacuum is used to extract the moisture using a hand held lance and during which the IBC is tilted to assist in moisture collection. A mop is often used to soak up droplets at this stage. Many users will accept IBC’s, which have been dried to this condition. If the user requires fully dry containers, this station is used to re-circulate hot air inside the IBC. A steam coil heat exchanger with high-powered fan ensures high circulation flow. The flexible duct is introduced into the IBC opening manually. It is important to allow the IBC to cool before leak testing is attempted. Here a ramp to floor level gives a buffer zone to allow this cooling. The containers are tested for tightness at this station. A head is introduced into the IBC and is clamped in place using pneumatics. Upon being given a signal, the tester automatically follows a timed test procedure, green or red lights indicating pass or fail. Some reconditioning Companies then, after approving the product, seal a foil over the valve outlet using an ordinary domestic clothes iron. Used Wood Shavings Transport Equipment SOLD! Used Woodshavings Baling Line SOLD! Used Pet Baler for sale SOLD!